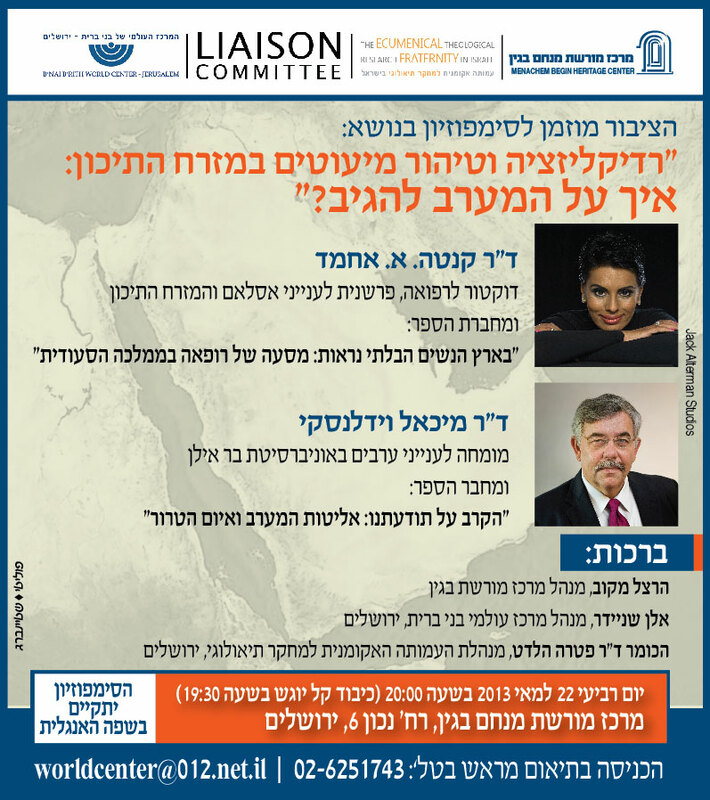 23.9.2013 "Israeli Christians Breaking Free: The Advent of an Independent Christian Voice in Israel"
Invitation (English) (Hebrew); Press Release (English) (Hebrew): Fr. Naddaf's speech (English) (Hebrew); Fr. Naddaf on VIMEO (password: naddaf); Dr Dror Eydar's article in Israel Hayom; Yuri Yalon's article in Israel Hayom. 22.5. 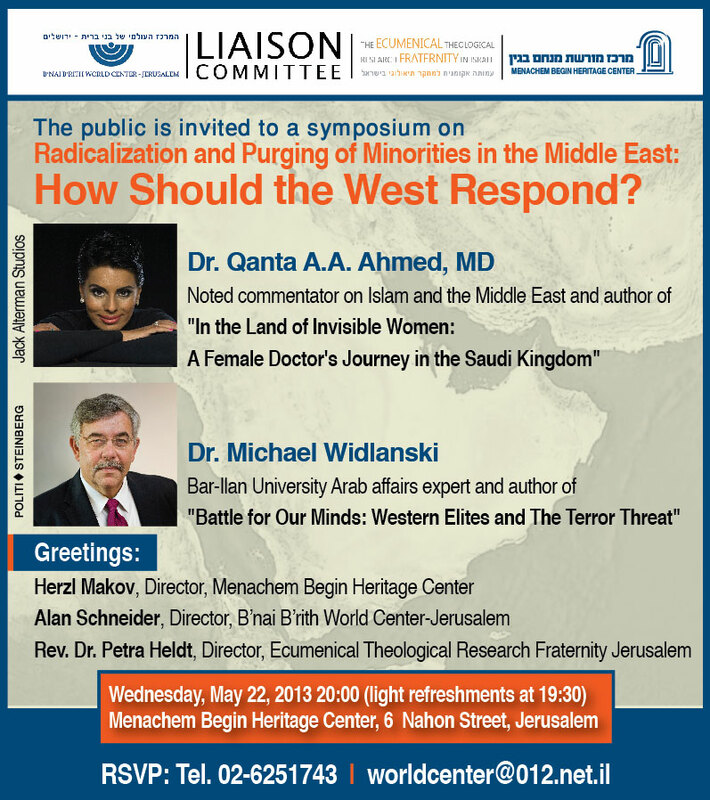 2013 "Radicalization and Purging of Minorities in the Middle East: How Should the West Respond?" Invitation (English) (Hebrew); Introduction (video); Dr. Michael Widlanski (video); Dr. Ahmed (video). 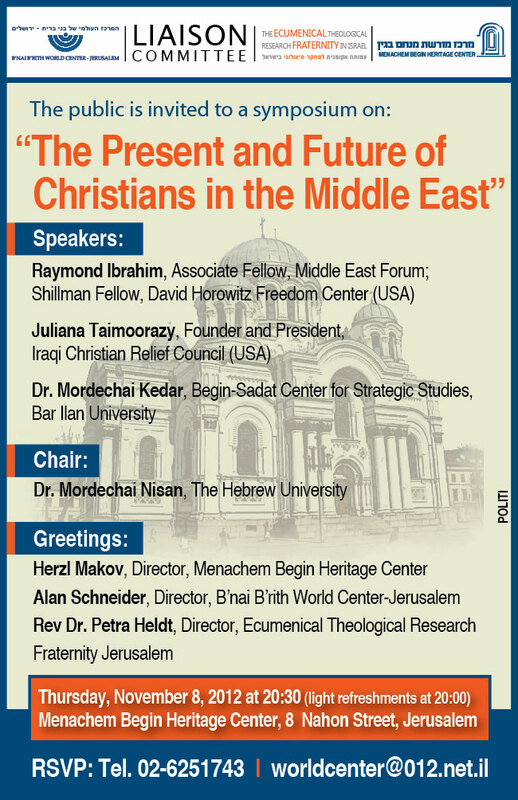 5-8.11.2012 "Consultation on the Protestant Churches and Israel"
Invitation (English); Concluding Statement; The conference on YouTube. 30.4.2012 "Islam & the Churches in West Africa: The Case of Uganda"
30.11.2011 "Religious and Ethnic Minorities in the United States: The Case of the Greeks"
4.6.2011 "With God on Our Side: Drawing Palestinian Support from the Evangelical Christian Community"
Invitation (English); Dexter Van Zile's Article; Dr. Don Stanley's Lecture. 28.2.2011 "The Rabbis' Letter: Halacha and Practice"
Invitation (English); The Rabbis' Letter (Hebrew) (English). 23.11.2010 "The Sumela Monastery in Modern Turkey. A Greek Orthodox Perspective"
8.6.2010 "Current Protestant Churches' Attitudes Towards the State of Israel: The Case of the PCUSA"
Invitation (English); An NCLCI statement: "Breaking Down the Walls".